Timber Hill Winery Owner and Winemaker, Amanda (O’Leary) Stefl is a Janesville area native, with strong roots driven by her Janesville family’s west side farms. 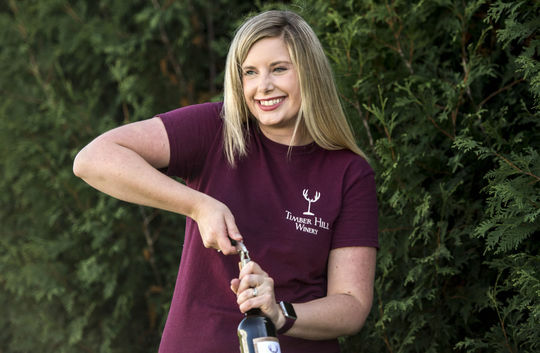 After studying Microbiology at the University of Iowa, and then continuing her education in Wine Making and Winery Management from Kirkwood College she was able to mix her unique training and start up Timber Hill Wines as one of the Midwest’s youngest female winemakers and winery owners. Stefl prides herself in making wines with youthful energy, creating specialty blends not like others, and providing an exclusive experience for wine tasting and drinking in Rock County. Here are Five Fun Facts about Amanda that you may not know! Amanda has been obsessed with llamas for years. When she lived in Iowa she would attend the Iowa State Fair and visit the “Llama Parade” they have every year. Now that she and her husband Matt live in the country, she hopes to add a couple of llamas to their mini farm in their new shed some day! She loves to cook and her favorite food is Pizza! ? She could eat it every day. Although, tacos are a very close second! Recently she competed in a neighborhood pizza contest and dominated! We will make sure to share her winning pizza recipe in an upcoming blog! She loves anything spicy. Hence, why she decided to make a Jalapeño wine! She likes to buy red pepper flakes from Penzey’s Spices that are extra hot, and puts them on her beloved pizza and tacos. She is obsessed with the show, The Office. She has probably seen every episode at least three times, maybe more. In college, her and her friends would pull pranks on each other similar to the pranks that the characters on the show pull. Her favorite prank was moving her roommates desk into the dorm bathroom! Today, February 26th, is her birthday! Please join us in wishing her a Happy Birthday on our https://www.facebook.com/plugins/post.php?href=https%3A%2F%2Fwww.facebook.com%2Ftimberhillwinery%2Fposts%2F1794650250838022&width=500” target=”_blank” rel=”noopener”>Facebook! On Wednesday she will be going live on our Facebook to answer questions, talk about upcoming changes and events, and more! Join her there Wednesday at 8 PM CST!